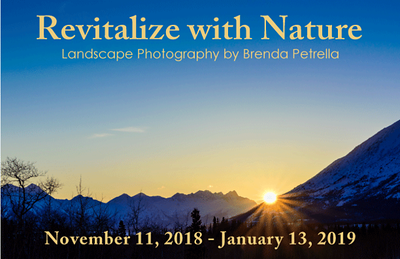 My exhibit, Revitalize With Nature, is now showing at The Derryfield School in Manchester, NH. The images in this exhibit are a collection of landscape, nature, and night sky images that have been part of my journey of reconnecting with the natural world after leaving a career in science. My hope is to inspire others to take some time to be outside to enjoy the sounds, smells, light, and calming beauty nature offers us. Please join us for the opening reception on Thursday, 12/6/18, from 5:30-7:00pm at the Lyceum Gallery. The exhibit will be on display until January 13, 2019. The Gallery is open weekdays, 8:00 a.m.- 4:00 p.m.
All exhibit prints are for sale. Images are printed using state-of-the-art laser exposure on Fuji Crystal DP II professional papers and mounted and sealed directly behind acrylic glass. For a preview of what these prints look like, please check out my video on printing images for this exhibit. 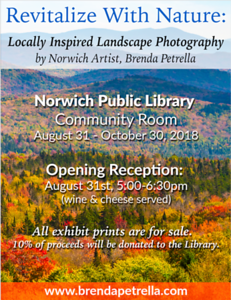 Come by the Norwich Public Library to see my latest exhibit, Revitalize With Nature. As an ever-advancing digital society, most of us interact with screened devices and man-made materials more than we engage with the natural world. We too easily forget that we are part of nature, not separate from it, and that some of the best ways to reduce stress is to reconnect with the natural world. We don’t have to travel very far to enjoy the peace that nature can provide; we just have to give ourselves the opportunity to seek it. Through this exhibit, I hope to inspire others to find ways to make time to get outside and find solace in our beautiful local landscapes. All exhibit prints are printed using state-of-the-art laser exposure on Fuji Crystal DP II professional papers and mounted and sealed directly behind acrylic glass. For a preview of what these prints look like, please check out my video on printing images for this exhibit. All prints are available for purchase, and 10% of proceeds will be donated to the Norwich Public Library. 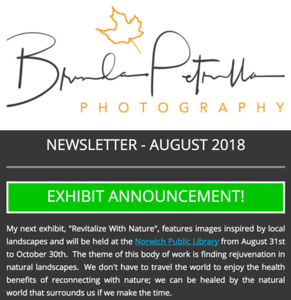 Check out my latest updates and events in my August 2018 Photography Newsletter! Add your email to our mailing list below to stay connected with future announcements. We have a lot of neat projects on the horizon! 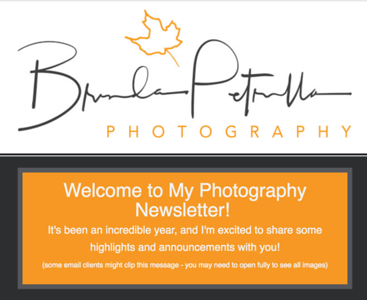 So many exciting things happening here at Brenda Petrella Photography. 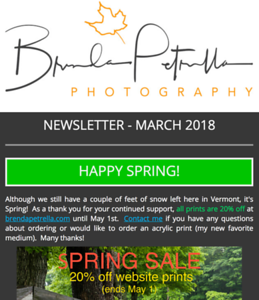 Check out my Spring 2018 Photography Newsletter for the latest updates! Feel free to share with anyone you think would be interested and sign up for future announcements using the subscribe button below if you haven't already. Many thanks! 2017 was an incredible year! From traveling to the Yukon and Alaska to photographing epic fall colors in Vermont, it has been quite a ride. Check out my 2017 Photography Newsletter for highlights. Add your email to our mailing list using the link below to stay connected with the latest updates. I'm starting to learn how to create timelapse videos. Here's my first compilation featuring thousands of images I took over the last year. I learned a lot in this process and am looking forward to honing my skills in this area. I have a few projects in mind for 2018, so stay tuned! I was lucky enough to meet this young moose while traveling in the Yukon. This photo was chosen to be featured in the National Wildlife Federation's 2018 "Trees for Wildlife" card line (coming soon). NWF partners with schools, local governments, and non-profits to plant a native tree for each pack of cards sold. This program helps keep our wild places wild and also involves kids in learning about how to protect our natural world. Thank you for supporting the National Wildlife Federation! 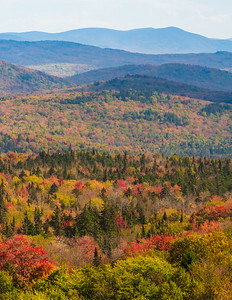 This photo of the autumn Vermont landscape was one of my most popular images this year. It was featured 10 times on Instagram by different promotional accounts and received over 26,000 likes! I took this image at the Silvio O. Conte National Fish & Wildlife Refuge in northern VT. The appreciation of this photo by so many demonstrates how we long for the beauty and serenity natural landscapes. Preserving wild places isn't just about protecting the biodiversity of species that live there; it is also about protecting our innate connection to nature. This short timelapse of the Northern Lights was taken during my 2017 excursion to the Yukon. It was recently featured by Travel Yukon on Instagram. Check out my interview on the Improve Photography Roundtable Podcast Episode 255 where I discuss how to photograph the Northern Lights and some tips on photographing in cold temperatures. Enjoy! This photo of Texas Falls received honorable mention in the 2017 Elden Murray Photographic Exhibition and Competition. Texas Falls is located in the Green Mountain National Forest in Hancock, VT and was one of the first waterfalls I've ever photographed. It remains a favorite!